In their final adventure the Futuremen are called on to save the Universe itself from a madman’s destructive whim! The Captain Future saga follows the super-science pulp hero Curt Newton, along with his companions, The Futuremen: Grag the giant robot, Otho the android, and Simon Wright the living brain in a box. Together, they travel the solar system in series of classic pulp adventures, many of which written by the author of The Legion of Super-Heroes, Edmond Hamilton. In their final adventure, the Futuremen are called on to save the Universe itself from a madman’s destructive whim! 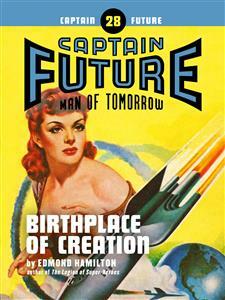 “Birthplace of Creation” was originally published in 1951. No part of this book may be reproduced or utilized in any form or by any means, electronic or mechanical, without permission in writing from the publisher. GARRAND watched the face of the Moon grow larger in the forward port of his small cruiser. A white and terrible face, he thought. A death’s-head with meteor-gnawed bones and gaping crater-wounds, bleak and cruel and very silent, watching him come and thinking secret boding thoughts about him. A feeling of sickness grew in him. “I am a fool and soon I will probably be a dead fool,” he said to himself. He was not a brave man. He was very fond of living and he did not think of death at all as a thing to be dared and laughed at. The knowledge that he was likely to die there on the Moon gave him qualms of physical anguish that made him look as white and hollow as the stony face that watched him through the port. And yet he did not turn back. There was something in Garrand that was stronger than his fear. His hands trembled, but they held the cruiser grimly on its course. The stark plains and mountain ranges took size and shape, the lonely mountains of the Moon that looked on nothing and the plains where nothing stirred, not even the smallest wind or whirl of dust. Men had gone out to other worlds and other stars. They had ranged far across space, founding colonies on asteroids and cities on the shores of alien seas. But they left the deathly airless Moon alone. They had looked at it once and gone away. There were only four who made the Moon their home—and not all of those four where men. Tycho Crater widened out below the little ship. Licking dry lips metallic with the taste of fear, Garrand consulted a map, drawn carefully to scale and showing in that desolation one intricate diagram of a man-made structure. There were ominous gaps in that diagram and Garrand was painfully aware of them. He made his calculations and set his ship down well beyond the outer periphery of defenses marked on the chart. His landing was a clumsy nervous one. White pumice-dust burst upward around the hull and settled slowly back again. Garrand cut his jets and sat for a moment looking out across Tycho, all ringed around in the distance with cliffs and spires and pinnacles of blasted rock that glittered in the light. There was no sign of the structure indicated on the chart. It was all below ground. Even its observatory dome was set flush, reflecting the Sun’s unsoftened glare no more than the surrounding plain. PRESENTLY Garrand rose, moving with the stiff reluctance of a man going to the gallows. He checked over the bulky shapes of a considerable mass of equipment. His examination was minute and he made one or two readjustments. Then he struggled into a pressure-suit and opened the airlock. The air went out with a whistling rush and after that there was no sound, only the utter silence of a world that has heard nothing since it was made. Working in that vacuum Garrand carried out a light hand-sledge and set it in the dust. Then he brought out the bulky pieces of equipment and loaded them onto it. He was able to do this alone because of the weak gravitation and when he was through, he was able for the same reason to tow the sledge behind him. He set off across the crater. The glare was intense. Sweat gathered on him and ran in slow trickles down his face. He suffered in the heavy armor, setting one weighted boot before the other, with the little puffs of dust rising and falling back at every step, hauling the sledge behind him. And fear grew steadily in him as he went on. He knew—all the System knew—that the four who lived here were not here now, that they were far away on a distant troubled world. But their formidable name and presence seemed to haunt this lifeless sphere and he was walking now into the teeth of the deadly defenses they had left behind them. He studied his map again. He knew exactly how far he had come from the ship. Leaving himself a wide margin of safety he activated the detector-mechanism on the sledge. The helmet of his pressure-suit was fitted with ultra-sensitive hearing devices that had nothing to do with sonic waves but translated sub-electronic impulses from the detector into audible sound-signals. He stood still, listening intently. But the detector said nothing and he went on, very slowly now and cautiously, across the dead waste until his footsteps in the dust approached the line of that outer circle on the map. Then the detector spoke with a faint small clicking. Garrand stopped. He bent over the panel of the mechanism, a jumble of dials, sorters, frequency-indicators and pattern-indicators. Above them a red pip burned in a ground-glass field. His heart hammered hard and he reached hastily for a black oblong bulk beside the detector. The thought was comforting but unconvincing. He forced his hand to steady, to pick up the four-pronged plugs and insert them, one by one in the proper order, into the side of the detector. Then he dropped behind the sledge and waited. The black oblong hummed. He could feel it humming where his shoulder touched the metal of the sledge. It was designed to pick up its readings from the detector, to formulate them, adjust itself automatically to the indicated pattern and frequency, to broadcast an electronic barrier that would blank out the impulse-receptivity of the hidden trap’s sensor-unit. That was its purpose. It should work. But if it did not…. He waited, the muscles of his belly knotted tight. There was no flash or tremor of a blast. After he had counted slowly to a hundred he got up again and looked. The red pip had faded from the ground-glass screen. There was a white one in place of it.